Kuching, 3rd July 2018: Sarawak Convention Bureau (SCB) commences a new era of Business Events as it relocates its headquarters to Plaza Aurora at Jalan McDougall, Kuching to further accelerate growth for the sector. 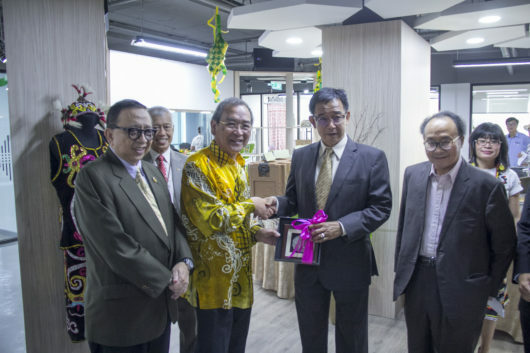 The launch of the new office was officiated by Y.B Datuk Abdul Karim Rahman Hamzah – Minister of Tourism, Arts, Culture, Youth and Sports Sarawak accompanied by Tan Sri Dato’ Sri Dr. Muhammad Leo Michael Toyad Abdullah – Chairman of Sarawak Convention Bureau. 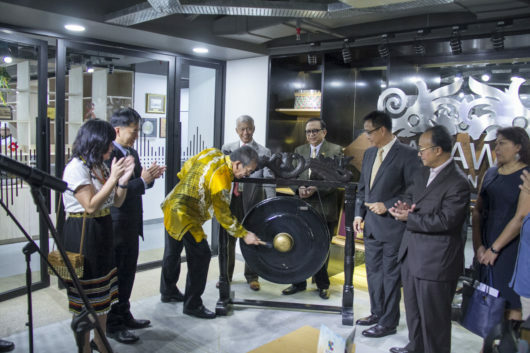 SCB’s Chairman, Tan Sri Dato’ Sri Dr. Muhammad Leo Toyad (3rd left) sounding the ceremonial gong with Minister of Tourism, Arts, Culture, Youth and Sports Sarawak, Datuk Abdul Karim Rahman Hamzah (3rd right) to formally officiate the launching of SCB’s new home. 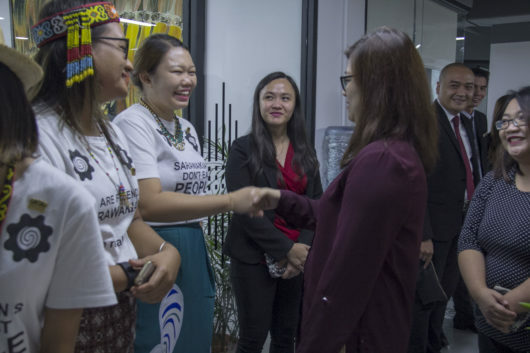 “I wish to congratulate SCB on this milestone, and we hope for the team to continue with your great work for the future of Business Events in Sarawak,” commented the state minister. SCB, the pioneering bureau in Malaysia, has cumulatively attracted 746 Business Events to Sarawak, contributing a direct delegate expenditure of RM 575.8 million in economic impacts, in addition to transforming Sarawak into a meeting hub in facilitating brand profile reputation, knowledge alliances, trade and investment, legacy development and other viable impacts beyond tourism. Also present were Datuk Abang Haji Abdul Karim Tun Abang Haji Openg – SCB’s Deputy Chairman & President of Sarawak Chamber of Commerce and Industry (SCCI), Datuk Haji Abang Abdul Wahap Bin Haji Abang Julai – Mayor of Kuching North City Commission (DBKU), Tan Sri Datuk Amar Wilson Baya Dandot –Chairman of Sarawak Biodiversity Council, and Mr Hii Chang Kee – Permanent Secretary of Ministry of Tourism, Arts, Culture, Youth and Sports, senior government officials and the entire SCB team led by Chief Operating Officer, Amelia Roziman. Datuk Karim Rahman Hamzah (3rd right), Minister of Tourism, Arts, Culture, Youth and Sports Sarawak receiving a token of appreciation from Tan Sri Dato’ Sri Dr. Muhammad Leo Toyad (3rd left), Chairman of SCB. They are flanked by Datuk Abang Haji Abdul Karim Tun Abang Haji Openg – SCB’s Deputy Chairman & President of Sarawak Chamber of Commerce and Industry (extreme left), Datuk Haji Abang Abdul Wahap Bin Haji Abang Julai – Mayor of Kuching North City Commission (2nd left), Tan Sri Datuk Amar Wilson Baya Dandot – Chairman of Sarawak Biodiversity Council (2nd right) and Amelia Roziman – Chief Operating Officer of SCB (extreme right). The SCB team extending a warm welcome to Business Events industry partners. The SCB Team is looking forward to accelerate Business Events growth from their new home. “Our new home will also house two headquarters from international associations in a bid to strengthen our destination’s position. We also encourage our clients and sector partners to make use of our spacious meeting room, which can easily accommodate up to 30 pax.” Amelia continued. 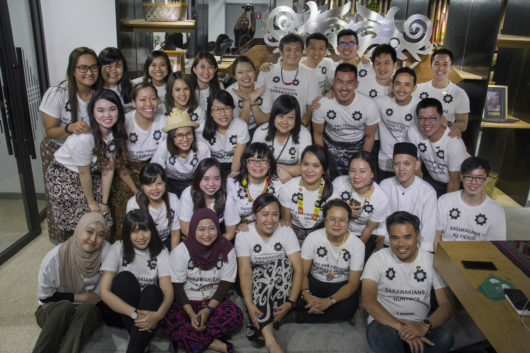 An example would be the first meeting for What About Kuching Festival 2018, which took place the very next day after the event. SCB’s new office’s address is Level 3, Plaza Aurora Lot 20, Section 30, Jalan McDougall, 93000 Kuching, Sarawak, with no change to the telephone, facsimile numbers, and email addresses.